One of the most picturesque and photogenic places in the world; with its vast mountain ranges and sweeping coastlines, it’s no wonder that New Zealand’s dramatic scenery is probably most famously known for its starring role as Middle Earth. Known as the Land of the Long White Cloud, New Zealand is made up of the North and South Islands and, with a population of just over 4 million, it’s gloriously uncrowded. Located about 1,500km from Australia and 1,000km from the Pacific Islands, there’s no doubt that New Zealand is remote. 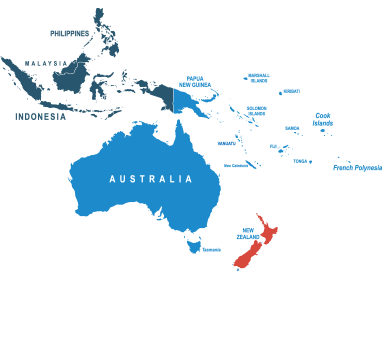 But, with DPD Local Online, sending a parcel to New Zealand needn’t be a daunting task. Whether you’re sending a parcel to Auckland, Wellington, Christchurch or somewhere much further off the beaten track, our extensive courier delivery network will ensure that sending your parcel to New Zealand goes as smoothly as possible. With a number of express and economy parcel delivery services at your fingertips, keeping your postage to New Zealand within budget is easy. Fill out our online form to arrange your postage to New Zealand in minutes. Do I need to deal with customs when sending from the UK to New Zealand? Don’t let the ‘ex-British Colony’ status fool you — you’ll still need to deal with international customs and import taxes when posting to New Zealand. That doesn’t mean that it has to be difficult, though. We make everything easy by sending you over all the necessary documents you need to make sure that your parcel gets through customs without any trouble. How much does it cost to send a parcel from the UK to New Zealand? Despite being halfway across the world, postage to New Zealand from the UK starts at as little as £27.30 when you book through DPDLocal-Online. We strive to provide cheap parcels for all of our customers, and with loads of options available on all our services, it's easier than ever to send the way you want to. How should I address my parcel for delivery to New Zealand? It may come as something of a surprise to know that New Zealand’s postal system is somewhat unique compared to the rest of the world, especially the UK. Basically there are three types of address in New Zealand: urban, rural, and PO box. These address types are not to be combined. To ensure your parcel is addressed correctly, check with the New Zealand Post’s addressing guide, or alternatively you can consult the Universal Postal Union’s overview. The general rule with New Zealand is that you can send anything that would be acceptable to mail here in the UK. For a general overview of those restrictions, you can visit our prohibited items list. Certain variants of these items are strictly prohibited, while others are permitted in small quantities. Check with New Zealand’s customs office for a full breakdown of your options.